Forecasting demand for mega-events is prerequisite for event managers since accurate demand is necessary to determine supply for mega-events. In this respect, the purpose of this study is to compare three types of forecasting methods when predicting demand for Expo visitors. These forecasting methods include 1) forecasts with willingness-to-visit(WTV), 2) forecasts with WTV+Gruber index, and 3) forecasts with WTV+Self-confidence index. The last two methods reflect feasibility rate. To this end national surveys were conducted to residents of 16 metropolitan cities and provinces using telephone and internet surveys. The results indicate that approximately 25 million Expo visitors were predicted by method 1(forecasts with WTV only), 10 million visitors were predicted by method 2(forecasts with WTV+Gruber index), and 18 million visitors were predicted by method 3(forecasts with WTV+Self-confidence index). The findings imply that forecasts with willingness-to-visit only overestimated Expo visitors as compared to such forecasts with feasibility rate as Gruber and Self-confidence indices. Thus, the findings of this study will provide researchers and event managers with appropriate forecasting method when predicting demand for mega-events. This research aims to analyze the political power process affecting the policy change of South Korea`s tour guide qualification system. For this purpose, previous studies on the qualification system, policy change and policy advocacy coalitions were reviewed, and the results of the related researches were discussed. In this study, a research model was developed based on the Advocacy Coalition Framework, which addresses the political power process of advocacy coalitions. A research proposition also was established to identify the influencing factors forming the political power process of advocacy coalitions. Major findings of the research demonstrate that two advocacy coalitions; ``employment-obligation`` and ``employment-recommendation``, were established and the policy change were made as a result of the resulting power process of these two coalitions. That is, the ``employment-obligation`` program was adopted by the coalition of pro-policy change. The findings highlight that this coalition is formed by horizontal networks, reveals shared values and a diversity of strategies. In conclusion, it was suggested that future studies on policy change should employ inclusive approaches covering rational policy change process as well as political power process. The purpose of this study is to identify the market segmentation of festival visitors according to their experience realms. The study of experience realms for festival visitors was previously by researchers Pine & Gilmore (1999). With the goal of adding further contribution to this approach, a surveys conducted at the Hampyeong Butterfly Festival reveals three main segments which can be categorized as entertainment experience group, education experience group and escapism experience group. Demographic characteristics by each segment reflect strong differences pertaining to age difference and age and identified marital status. As for the festival experience characteristic differences were also found significantly depending on the number of participation programs, travelling companions type and expenditure. And the festival satisfaction of each cluster was found significantly different. In conclusion, this study provides the opportunity to observe and target the experience realms for different market segments. Suggested in the recommendations is that festivals and events such as the Hanpyeong Butterfly festival should consider and pay careful attention to the specific needs and requirements of the different market segments. This aim of this study is to suggest criteria for evaluating lovemarks used to measure the emotional relationship between tourists and festival brand, and to examine how lovemarks, developed through Structural Equation Modelling SEM) and environmental cues, can influence satisfaction and behavioral intention. In this pursuit, visitors at various regional festivals sanctioned by the South Korean Ministry of Culture and Tourism, including the Geumsan Insam Festival, Icheon Rice Cultural Festival, Ceramics Festival of GIMHEA, and the PUSAN International Film Festival, were surveyed. The relationships hypothesized in the model were tested simultaneously by using SEM, and these results could be summarized as follows. First, Strategic Experiential Modules and Environmental cues show positive effects on Lovemarks β=.797, β=.213). Second, lovemarks on satisfaction (β=.750) and behavior intention (β=.426). Third, satisfaction influences positively on behavior intention (β =.447). Theoretical and practical implications are discussed and future research direction are outlined. Putting the results and implications of this study together, the management of the festival brand should be extended to the area filled with love that can capture consumer`s mind. This study investigated the attribute-utility difference in the effects of low-carbon information on purchase intentions of green tourism products. This study also examined a variation of environmental consequences might incline subjects to choose more environmentally friendly alternatives. In this pursuit, it examined the utility difference by using five determinants such as transportation, lodging facilities, organic food, leisure and resource product. 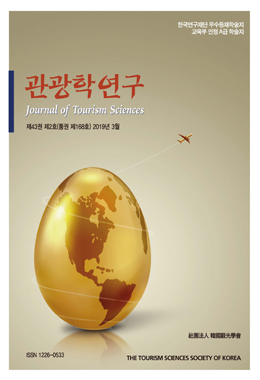 Data were collected through survey of 239 visitors to the Bomum Special Tourist Complex in Gyeongju, South Korea. Conjoint, t analysis, and ANOVA were performed to determine effects of attributes of low-carbon green tourism. As a result of the research, in the same as their purchase intentions toward low-carbon green tourism products prior to disclosure of information on carbon emissions, low-carbon food, food materials, accounting for 27.782%, was regarded the most important. Moreover, as shown in utilities according to attribute levels, the use of carbon-emitting transportation was shown -0.007 and bicycle/walking was shown 0.007, indicating the effect of low-carbon transportation towards purchase intention. This implies that eco-labels promote the choice of environmentally benign alternatives. The purpose of this study was to determine and build tourism development indicators responding to climate change. Delphi survey and AHP were employed to carry out this study. The attributes of tourism development to respond climate change were analyzed and selected. The importance of each attribute was evaluated, reviewed, and verified, and tourism development indicators were developed to respond climate change. By arranging the tourism development indicators, the importance of each perspective was investigated through AHP. A total of 148 tourism development indicators were drawn to cope with climate changes. Thirty of them were grouped into the field of land use, 30 were in the energy and building, 25 in the transportation, 26 in the recycled resources, and 37 were in the tourism management. The findings are mostly consistent with previous studies in the tourism field, and somewhat consistent with previous studies in architecture and ecological environment. The results could be used as the guideline of effective decision-making for tourism developers. However, this study has limitations relating to the generalization and interpretation because the developed indicators have yet to be objectively evaluated and applied. The purpose of this study is to examine the direct influential relationship between residents` perception (economical, social, cultural, and environmental impacts) toward walking-tour course development and development support, and to investigate whether local resident attachment plays a moderating role in its relationship. A total of 350 questionnaires were distributed to local residents who live in proximately to the 7 and 8 Je-Ju Olle course. The usable 269 samples were analyzed by structural equation modelling analysis. Findings from this study are as follows: First, it is found that there are the significant causal relationships between antecedents(economical·cultural impacts and environmental impact) and consequences support for Ollegil development; Second, support for Ollegil tourism development was not influenced by social impacts; Lastly, it is identified that local attachment has a moderating effect on the relationship between economica and cultural impacts and support for Ollegil development, as well as between environmental impact and its support. The paper concludes with recommendations for sustainable and successful development of walking-tour tourism with theoretical and practical implications discussed. The purpose of this study was to better understand visitor segmentation at World Heritage sites based on a visitors motivation profile and the moderating effect of representative list of World Heritage sites. A total 528 valid samples were collected from 11 - 26 September as the Andong Hahoe Folk Village. Data was analyzed with descriptive statistics, Exploratory Factor Analysis (EFA), cluster analysis, discriminant analysis, cross-tab and regression analysis. World Heritage motivation questions measuring the results of factor analysis ``Cultural Heritage``, ``Friendly``, ``Tourist Attraction``, ``Novelty`` and ``Escape`` of the five factors were derived from EFA. Cluster analysis of tourist types according to the tourists`` motivations are ``Escape and Socialization seekers``, ``Cultural Heritage seekers``, ‘Relaxation seekers`` and ``Attraction seekers``. In addition, findings indicate that in the relationship between motivation and satisfaction, the results of hierarchial regression analysis which focused on the moderating effect of a representative list of the World Heritage site were that the representative list is evidenced to influence the relationship between tourists` motivation and satisfaction.